A super easy granola recipe with almonds and homemade caramel. 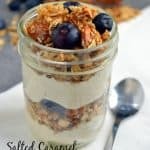 Perfect for topping yogurt, ice cream, or making parfaits! Line a large baking sheet with parchment paper. Set aside. Preheat the oven to 300°F. In a large bowl, toss together the toasted oats, flax seeds, and almonds. Set aside. Add the water to a small saucepan. Pour the sugar into the center of the pan (in a pile so it doesn’t touch the sides). Bring it to a boil and then reduce the heat just a little to medium high. Let the mixture cook. It will need to simmer for about 10 minutes until it turns a pretty amber caramel color. WATCH IT CLOSELY!!! It goes from perfect to burn pretty quickly. When the color looks right, place the pan in the sink. Add the milk or cream. The mixture will sizzle and bubble up. Stir quickly until it’s smooth, then stir in the vanilla. Pour the caramel over the oats and almonds and toss to coat. Add the honey and oil to the same saucepan. Heat over medium until they blend. Scrape into the bowl. Bake for about 30 minutes. Let it cool completely. The granola will scrape off the parchment in oat clusters. To toast the oats, preheat the oven to 350°F. Scatter the oats evenly across the bottom of a 9 X 13 pan, and let them toast in the oven, stirring at least once, for about 15 minutes.